Check yes for fall. 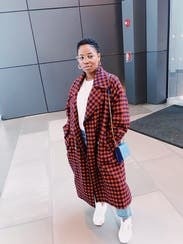 This oversize gingham plaid coat by Sea New York is the one to reach for again and again. Orange plaid wool (60% Wool, 24% Polyamide, 12% Acrylic, 4% Other Fibers). Coat. Long sleeves. Exposed front button closure. Partially lined. Front pockets. 45" from shoulder to hemline. Made in USA. I love this. However, it's HUGEEEEEE. I got a medium and I think I need an XS. Huge, even if boxy fit. I could've fit two of myself in one (Size Small) coat! I made it look fitted in the photo, but when I buttoned the coat, it just looked like I was wearing a designer sack. Runs large, but that's the style. I rented a small and it's pretty huge. This jacket was very oversized, I was swimming it in. Cool colors, also saw another girl with it at the bar I went to. So many compliments! Love Love Love! No cons, the best coat ever! This was enormous on me! It was absolutely huge. I'm 5'3 102 lbs and it was so big it was unwearable. But the quality is really nice. Too bad. 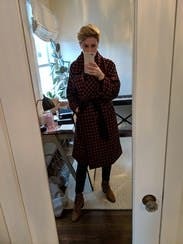 At first when received this coat, I was slightly upset with how loose the fit was, BUT once I found the perfect pairing I fell in love! My friends and even strangers openly complimented it! The loose fit allows you to layer during the fall (which NY has completely skipped). Definitely planning to rent again!! This was huge- but it's cut well, so it totally works, even for my petite frame. . I couldn't decide if I loved or hated the color/pattern...but in the end I decided that it was actually pretty awesome because it borders on ugly-fab. Looked great. Warm and fun to wear. Very roomy so don't size up. It runs very large which I was not expecting. 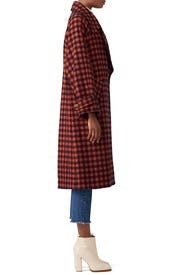 If you can rock the oversize look then it's probably great but not for me, unfortunately. 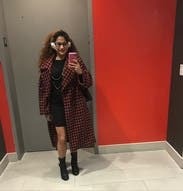 I rented this coat for a week working in New York in the dead of freezing winter. 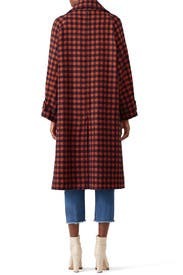 It is definitely oversized, but on purpose, and in a fun, chic Olsen-sister way. 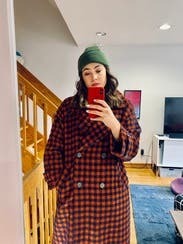 I liked that it easily fit over my blazers, great for layering, and the colors are fun - lot's of compliments and kept me cozy warm! I didn't end up wearing this coat. I am 5'3" and even in XS it was much too oversized. This was a super fun jacket. I received many compliments on it throughout the night. 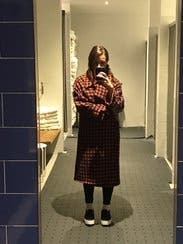 The oversized style made it super comfy. The colors are fun and made it super easy to pair with. Amazing! 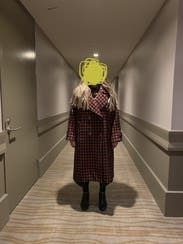 I got stoped so many times by people asking where this fabulous coat was from. It's so fun! This coat was so comfy and warm. I loved how oversized it is, but I'm taller, so it worked! 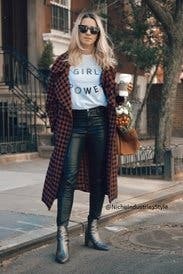 I layered with it and couldn't get enough of the trendy plaid pattern. The jacket is for those looking to make a statement. It's oversized, but in a good way. It layers well and is perfect for a cold winter day. It's really big. And not oversized, just big. I wrapped it and belted it and it looked cute. I'm 5'10" and wore it with boots to offset the quantity of fabric. Didn't want to return this! Perfectly oversized, great quality, striking color/pattern. A million compliments on this. I lost count of how many times I wore it. Only returned because I'm changing hemispheres for a month and needed to switch to a warm weather wardrobe! 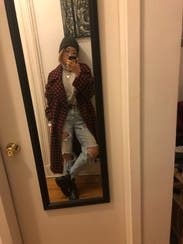 I LOVE THIS COAT. My favorite RTR rental ever. This is supposed to fit boyfriend style, but it's still very large, so order one size down. The fabric is soft and thick enough to keep you warm in 25 degree weather. 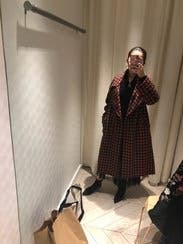 I ended up not wearing the coat because it is massive. 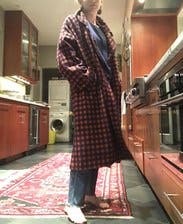 It ended up looking like a giant bathrobe on me. I'd recommend sizing down at least one size, possibly two. 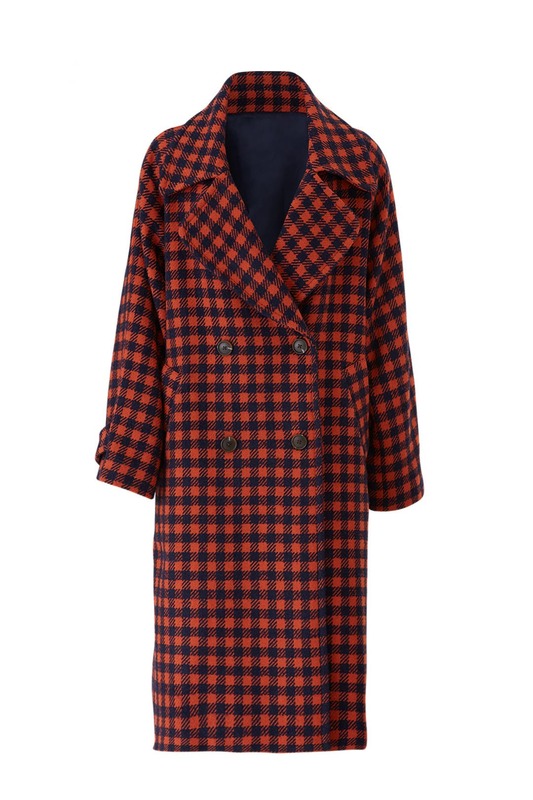 This coat is the stuff of dreams! The thickness, the pattern, the texture, everything is dreamy! 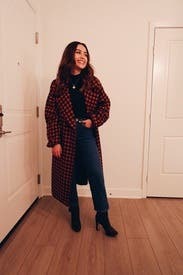 I wore it on a date night out with my husband and got tons of compliments. It's very very warm because it's wool, so perfect for winter or cold weather. You should be warned: it is HUGE. 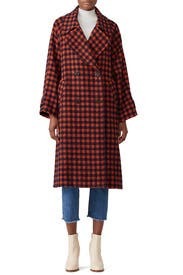 And I love oversized stuff but this coat, even the size Small that I ordered, was extremely large on my 5'4 frame. So keep that in mind. Other than that, it's a lot easier to style that I thought and I loved wearing it! 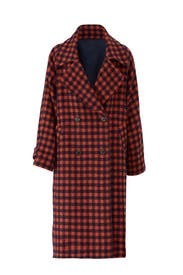 cute, stylish overcoat with soft to touch fabric, not scratchy. really really oversized. I wore heels so the fit was fine. got compliments all night! love the colors! 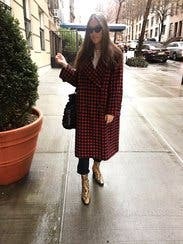 This coat was perfect for NYC weather. I could dress it up or down. Super professional and hip! This jacket is over sized but that is what I loved most about it. Anything can fit underneath it and you feel so chic because it is the right amount of baggy. Awesome Orange and Navy check print. Definitely will rent again! I loved everything about this coat. It was fashionable, practical, and cozy. The colors were brilliant and the pockets were a nice size. I loved this and it's quite chic. However, it is huge and if you're going for the 'wearing a sleeping bag but make it fashion' - this jacket is for you.